Globally, countries are increasingly prioritizing the reduction of health inequalities and provision of universal health coverage. While national benchmarking has become more common, such work at subnational levels is rare. The timely and rigorous measurement of local levels and trends in key health interventions and outcomes is vital to identifying areas of progress and detecting early signs of stalled or declining health system performance. Previous studies have yet to provide a comprehensive assessment of Uganda’s maternal and child health (MCH) landscape at the subnational level. 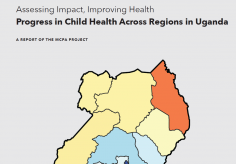 By triangulating a number of different data sources – population censuses, household surveys, and administrative data – we generated regional estimates of 27 key MCH outcomes, interventions, and socioeconomic indicators from 1990 to 2011. After calculating source-specific estimates of intervention coverage, we used a two-step statistical model involving a mixed-effects linear model as an input to Gaussian process regression to produce regional-level trends. We also generated national-level estimates and constructed an indicator of overall intervention coverage based on the average of 11 high-priority interventions. National estimates often veiled large differences in coverage levels and trends across Uganda’s regions. Under-5 mortality declined dramatically, from 163 deaths per 1,000 live births in 1990 to 85 deaths per 1,000 live births in 2011, but a large gap between Kampala and the rest of the country persisted. Uganda rapidly scaled up a subset of interventions across regions, including household ownership of insecticide-treated nets, receipt of artemisinin-based combination therapies among children under 5, and pentavalent immunization. Conversely, most regions saw minimal increases, if not actual declines, in the coverage of indicators that required multiple contacts with the health system, such as four or more antenatal care visits, three doses of oral polio vaccine, and two doses of intermittent preventive therapy during pregnancy. 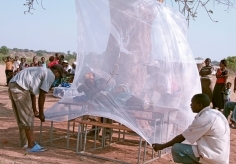 Some of the regions with the lowest levels of overall intervention coverage in 1990, such as North and West Nile, saw marked progress by 2011; nonetheless, sizeable disparities remained between Kampala and the rest of the country. Countrywide, overall coverage increased from 40% in 1990 to 64% in 2011, but coverage in 2011 ranged from 57% to 70% across regions. The MCH landscape in Uganda has, for the most part, improved between 1990 and 2011. Subnational benchmarking quantified the persistence of geographic health inequalities and identified regions in need of additional health systems strengthening. The tracking and analysis of subnational health trends should be conducted regularly to better guide policy decisions and strengthen responsiveness to local health needs.